The ‘tradition’ in one of my church’s has been to have a Christingle service on Christmas Eve. I’ve nothing against them, but I wanted to do something different this year. Relying on last year’s example of a good number of visitors, I decided that I was going to have a nativity play – where (almost) everyone got a part. So, we had loads of props and dressing-up stuff, and even those who didn’t get that into things were expected to join in the heavenly choir of angels shouting ‘Hallelujah’ at appropriate points, or providing animal noises for the stable. It was first come, first served for the main parts, but there was the possibility to be part of the group of shepherds, or join the angelic ranks. In the end, most folk participated to some degree. It was all a bit chaotic as I tried to narrate and provide some scene-setting direction to those about to have speaking parts. 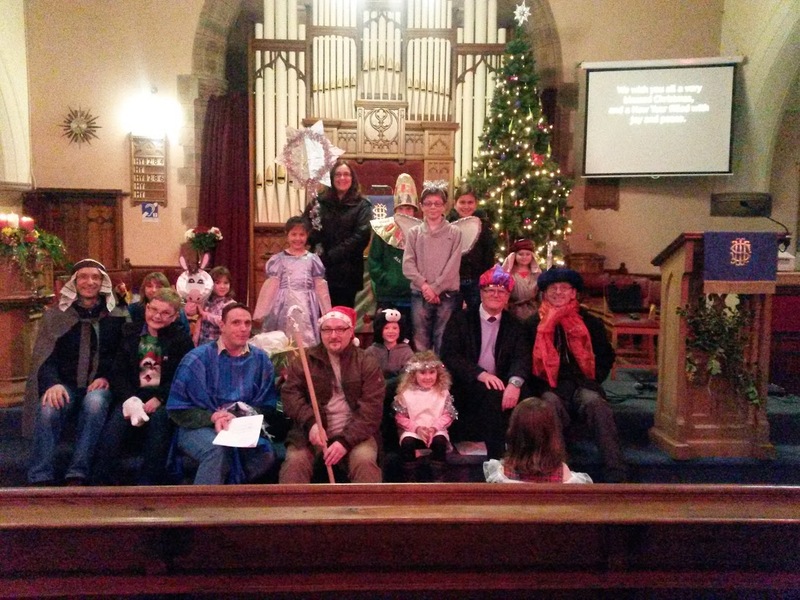 It was all a bit of a laugh, with the Christmas story being told through song, readings, and the nativity scenes. But the main point was that everyone had an opportunity to join in, and it was this point I made when I summed it up. Christmas is an invitation to participation – through God’s ‘participation’ in our life through the incarnation. We could sit back and be passive spectators, ooh-ing and aah-ing at the cute presentations, but Christmas is a call to become involved; to be part of the good news story. I hope everyone who came along ‘got’ that tonight, even in the messiness of it all (and there’s a message there too, I suspect). I hope that you too will be blessed this Christmas, and that you get that bit more involved with God, as he calls us to participate in the ongoing story of his love come to us at Christmas. It was KHR’s nativity play today and a very lovely service it was too. It was interesting to see that the entire service was given over to it rather than the Sunday school just getting a ‘slot’ in the service. It all seemed to go without a hitch and the kids did really well, although there were no speaking parts, so that minimises the risk. The costumes were great and, although not elaborate, must have taken some time to do. The story was told through ‘the star’. Initially the star was unable to ‘twinkle’ like the others and it was only when it received a smile from Jesus that the star was able to shine and kept on shining gloriously. The little girl who played the star was excellent and her mannerisms and expressions were spot on – a huge beaming smile, that stayed on, after she was able to ‘twinkle’. The story may not have been strictly scriptural, but it’s message was pretty sound. Whether it was picked up by the visiting mums, dads, etc is anybody’s guess, but the Sunday School can’t be faulted for the way the good news was presented. It was even the first time I think I’ve heard ‘Away in a manger’ sung in tune. It might seem churlish to be critical, but I would have liked to see less narration done by the Sunday School leader and more by, say, the older kids or the Bible class (although they led the readings and prayers very well), even if it meant taking turns to do a bit of the narrating. But really, that’s a minor quibble and they definitely deserved the applause they got at the end. Interesting to see someone in government speaking out against the ‘pc’ brigade. In the second report it’s interesting to note that it’s not other faiths who have a problem with Christmas or Christianity, it seems to be those with ‘an agenda’ – arguably a misplaced one. I think I’d agree with Mark Pritchard’s assessment that an erosion of Christian ‘rights’ (not the correct word, but can’t think of another at the moment) will eventually lead to a more extremist backlash. I don’t mean that in the sense of a violent protest, rather that the voice of Christianity that will become most vocal will be the more fundamentalist one.